In October 2010, I introduced a blog called “1-Minute Inspirations” in which I released a new video every Wednesday morning. The format was always the same: there was a beginning quotation followed by 60 seconds of narration, music, and photography. Each video was built around a single thought that provided a bit of momentary depth or encouragement or hope. People seemed to appreciate the brevity of the video and the personal integration of my writing, my voice, and my photography with Eric Clancy’s piano music. “Why not try a similar approach for a more specific audience, built around a particular need?” I asked myself. So after a year of producing these weekly videos, I returned to an earlier professional interest and began creating a series of short messages for the bereaved. My initial idea was to create 50. Realizing there was so much that needed to be communicated, I doubled the number and titled the project, “100 Healing Messages for Your Grief.” This resource is now available to everyone, and you’re among the first to know about it. Once you subscribe, or subscribe a friend, to these messages through the Willowgreen website, you’ll begin receiving a brief, personalized email every Monday, Wednesday, and Friday morning, introducing that day’s topic. A link within the email will lead you to a separate page where the video has been set up to play for you. Each video message is designed to console, validate, inform, and encourage, always ending on a hopeful note. The viewer can also download a beautifully formatted PDF of each message, suitable for reading, collecting, or sharing with others. If you would like to see a sample of the 100 Healing Messages and learn more about ordering this resource with all its 100 videos and PDFs, follow this LINK. It has been a very full and challenging year of work and I’m pleased that everything has all come together so well. As you’ll see, “100 Healing Messages for Your Grief” carries a distinctive Willowgreen touch from beginning to end. I’m looking forward to offering a new form of grief support through the internet unlike anything that has been created to date. If you have any thoughts about this work once you’ve seen the samples noted above, I’d love to hear from you by email: jmiller@willowgreen.com. 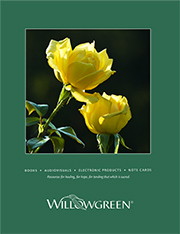 Regardless of the extent of your knowledge of Willowgreen products, you have probably seen some of the extensive photographic library created by Willowgreen President and Owner James Miller. The following is a brief discussion with him as a photographer conducted by Cat Voors, the newest staff member and InSight editor at Willowgreen. C: Beautiful nature photography is such a strong element of nearly everything that Willowgreen does. When did you become a photographer? J: I had a Brownie Hawkeye as a boy and a Kodak Instamatic as a young man, but I didn’t become serious about photography until I was 30. J: There was an avid amateur photographer in the congregation where I was minister. He kept telling me that I should buy a good camera because he thought I had an eye for photography, but I couldn’t afford something that expensive. Realizing that, he and his wife gave me a new Nikon camera as a surprise birthday present. C: That was very generous of them. J: Yes, indeed, though I learned afterward that they subsequently took that same amount of money out of their church pledge over a three year period. C: Did you undertake formal photography study right away? J: Remember: I’m a man and men don’t ask directions. I learned to photograph by reading on my own, by asking questions, and by watching how my friend photographed. Mostly I exposed a lot of film, and in doing so, I made a huge number of mistakes. Then I tried my best not to make those mistakes a second time. C: So many of your images are from nature. Why nature? J: I know of no more beautiful subject. Or more diverse. I also love just being out in nature, especially in early mornings and late evenings. Sometimes my camera around my neck is simply my excuse to explore the natural world, whether or not I make any images. C: So you use nature photography in your videos, books, and presentations because it’s pretty? J: Not really. I use images from nature because they’re interesting and informative, life-giving and life-enhancing. I also use such images because they’re undated—they never go out of style. A photo I made of a maple leaf forty years ago looks not a day older than a maple leaf that poses for my camera today. That helps my books and videos have a longer life visually. C: Are there any other reasons you concentrate on nature photography? J: This is the real one: I like the way it’s possible to create images that hint at certain human emotions—joy or sorrow or love, for example—or certain human experiences—being in silence or going on a journey, for example—without making the subject so obvious by showing someone in tears or two people hugging, for instance. Such nature photography gives the viewer room to bring his or her own feelings and thoughts into the images. This is especially the case if there is accompanying music. C: How many images have you made through the years? J: I’ve never stopped to count. Hundreds of thousands easily. I can tell you that I commonly throw away five or ten for every one I keep. Today I have well over 100,000 photos on file. C: How do you file so many images so you can find them readily? J: All my older images are slides and they’re filed in specially constructed metal cabinets with panels that pull out for easy viewing. You can see 100 slides at a time. When I went digital in 2002, I created a second complimentary system for digital images on a dedicated computer in my small studio. C: What type camera do you use? J: I carry two identical DSLRs (digital single lens relexes) and a variety of interchangeable lenses. Which brand? I always say that any brand is good as long as it’s Nikon. C: What are the responses to your photography that gratify you the most? C: What is the single most memorable response you’ve ever known? J: I was leading an all-day workshop in Dayton, Ohio when a man came up to me during one of the breaks. He named one of my early videos and said he had watched it daily for many months after experiencing a traumatic loss in his life. Then he said to me, “Your photography and your narration saved my life. Without them I could not have gone on. I mean that literally.” Hearing his words and looking into his face as he spoke was both a very humbling and very gratifying experience. C: You’re a fortunate man. J: Without a doubt I am blessed to have found this sort of work to do—work for which I have had almost no training. I believe there is a deep sense in which I did not find this work but rather it found me. I once had the pleasure of spending a week at Monet’s Garden in Giverny, France. Six other photographers and I had private access to the grounds each morning and evening, before and after the public was allowed inside. The noted French artist created these gardens in the last half of his life so he would have subject from nature to paint without needing to travel far out in the countryside. While I was there, I attempted to make a few images in my camera that were reminiscent of his impressionist style of art. Then I forgot about them. Recently I retrieved a few of those images and coupled them with quotations from his letters to friends. I find his ideas about nature, the world, art, and life resonate with my life today. Perhaps they will resonate with yours too.